Diana Ralys is the owner of Radiance Wellness Spa and product formulator of Diana Ralys Skin Health. Diana has worked in the skin care industry since 2004, a practicing skin therapist, she knows how the skin works inside and out. Using her knowledge she formulated a natural skin care line that WORKS! You won’t find water in any of her products, only active ingredients, both from nature and science. Handmade in small batches to ensure quality. Made with love and passion. After working years in a corporate health spa Diana decided to start her own practice. Radiance Wellness Spa was not the space it was at the beginning. Premium Skin Care by Diana was the first name she started with, working with private clients in a one room office in a medical building. In March 2016 Diana branched out and opened this beautiful location with multiple treatments rooms, sauna booths, full retail store, and rebranded as Radiance Wellness Spa. Diana Ralys Skin Health product line started in the treatment room. 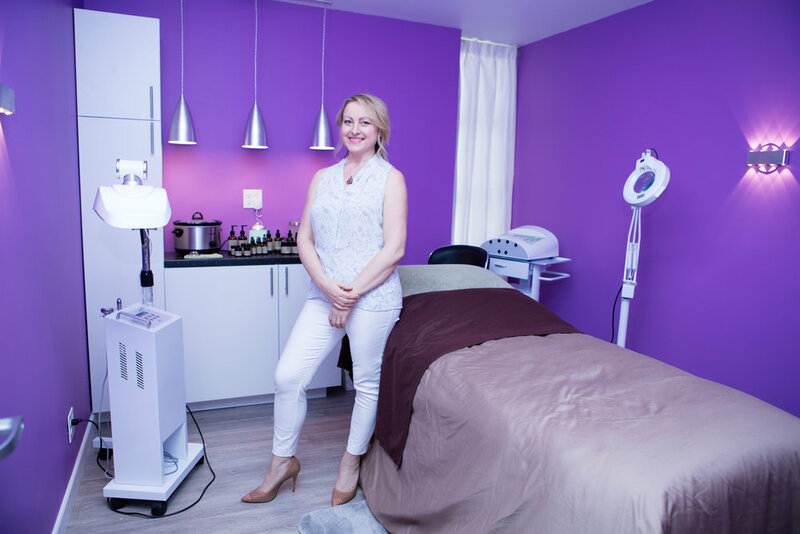 When Diana couldn't find the perfect product for her clients that both worked and was non-toxic, she created her own concoctions to use in the treatment room. It wasn't long before her clients craved those concoctions at home. Product by product, Diana Ralys Skin Health grew and is still growing today. As new ingredients are becoming available to the industry and more studies emerge, Diana's formulations change for the better. To boost results, all naturally derived ingredients are paired with biologically active ingredients. The marriage of nature and science enables the products to work effectively without harming the user or environment. Core ingredients include Algae extracts, Hyaluronic Acid, Argan Oil, Oxygen Plasma, natural clays, Rosewater, Aloe and much more. Once products are packaged, Diana, who is also a Reiki Master, performs Reiki to each of them, ensuring that every bottle has a high frequency of love and intention to nurture those using them. Aloe Vera- Organically grown and imported from India. 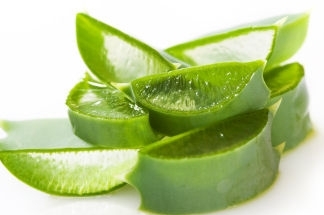 Our Aloe Vera is extracted from the inner fillet of the leaf. This inner fillet is the most potent portion of the plant. It is cold pressed and filtered to form the purest Aloe Vera. Aloe Vera can penetrate up to seven layers of the skin, where as water can only penetrate up to two. This is why Aloe is so healing and nourishing to the skin, it heals from the inside out. Aloe vera gel contains two hormones: Auxin and Gibberellins. These two hormones provide wound healing and anti-inflammatory properties that reduce skin inflammation. Products that contain variations of Aloe: Hydra-Nourishing Gel, Cell Regenerating Gel, Charcoal Cleanser, Gentle Quinoa and Papaya Cleanser, Manuka Toner, Premium Balance Toner, Manuka Cream, Hydra Firming Mask, Papaya Pumpkin Mask, Volcanic Lava Mask. Prickly Pear -Oil-Prickly Pear cactus is known as the miracle plant for its ability to survive during long droughts and still produce healthy fruits. The Prickly Pear fruit contains numerous small black seeds from which the precious Prickly Pear Seed Oil is extracted. Each seed contains only 5% of oil, so the production of 1-liter prickly pear seed oil takes about one ton (1,000 kg) of fruits to extract 25 kg of seeds (1 million prickly pear seeds). Prickly Pear Seed Oil has a high concentration of Tocopherol (Vitamin E) and essential fatty acids (Linoleic Acid or Omega 6). This oil contains more tocopherol than any other oil available in the beauty care market (almost 150% more tocopherol than Argan oil). Tocopherols have strong antioxidant and free radical scavenging properties. Products that contain Prickly Pear Seed Oil: Cell Regenerating Gel, Specialty Blend Oil, Ultimate Regenerating Serum. Marula Oil- Marula Oil contains high levels of antioxidants including Vitamin C, tocopherol (vitamin E), tochotrienol, phenolic compounds, essential amino acids and flavonoids, these deliver protective benefits and can help prevent reactive oxygen species and free radical damage that contributes to aging. Marula Oil is also rich in essential fatty acids Omega 9 - oleic and Omega 6 - linoleic that deeply hydrate and reduce redness while nourishing, healing, moisturizing and improving skin elasticity. Composition: Mono-unsaturated fatty acids: Oleic acid (70-78%) Polyunsaturated fatty acids: Linoleic acid (4.0-7.0 %) Alpha-linolenic acid (0.1-0.7 %) Saturated fatty acids: Palmitic acid (9-12%) Stearic acid (5.0-8.0 %) Arachidonic acid (0.3-0.7 %). Oxygen Plasma- Oxygen Plasma is a complex carbon molecule that “mimics” the bloods ability to carry oxygen and active substances into the cells. Oxygen Plasma is a completely natural and organic substance developed during the 1980s for military purposes by some of the most brilliant scientists in the world. The research has been declassified and this substance is now being used in beauty and medical applications. Oxygen Plasma is chemically inactive and therefore it cannot not cause any irritation. Oxygen Plasma is essential for all skin types and conditions. It kills bacteria causing Acne and Acne Rosacea, triggers formation of Collagen and Elastin, allows much better product penetration and increases their effectiveness ( We like to mix it with serum in the morning and Specialty Blend at night), accelerates regeneration of skin cells, excellent for any skin irritation, including Eczema, sunburn (or any other burn). Activated Charcoal- Charcoal is produced by slow pyrolysis, the heating of wood or other-substances in the absence of oxygen. Activated charcoal, carbon that’s been treated to increase its absorbency is the one that is used in beauty products. Charcoal’s ability to adsorb harmful substances is very strong. Activated bamboo charcoal powder absorbs odors and purifies water. Most water purifying systems use charcoal to clean the water. Even up until now, Charcoal is used in hospital emergency rooms after a person swallows or absorbs almost any toxic drug, chemical or alcohol overdose. It works by attaching to toxins in the stomach and absorbing them before the bloodstream can. In beauty products it work just like it does internally. It acts like a magnet to attract and absorb dirt, oil, toxins and then gets washed away when you rinse the product off. Argan Oil- Argan Oil quality is a huge factor in benefits for your skin. There is a natural way to extract the oil from the nut and a synthetic way or using large metal machines. Argan oil, just like any other natural ingredient, the quality and benefits will be true only in the highest quality product. Argan Oil comes from Morocco. All of it. The Argan tree (Argania Spinosa) grows exclusively in Morocco, in some of the harshest environments on earth, and can flourish up to 200 years. Argan oil, cosmetic or culinary, is made from the kernel found inside the argan tree fruit. Women crack open the argan nut between stones to extract the kernel, which is then cold pressed. Diana purchases Argan Oil that is used in Diana Ralys Skin Health products from family owned and operated company in Morocco. Diana trusts and appreciates the quality and it feels great to support small family business, as Diana Ralys Skin Health is also 100 percent family own and operated. 1. Selecting the fruit: Between June and August, the women harvest and gather the fruit by hand. This fruit is dried for several weeks in the sun by spreading the fruit on the roofs of mud-brick houses. 2. Cracking the nuts: Crushing Argan nuts to obtain Argan kernels (seeds). The nuts are crushed between two stones BY HAND! 3. Grinding the kernel: they use a process known as cold press, slowly extracting the oil from the kernel, to best preserve the oil’s natural medicinal properties. 4. Filtration: this process is one of the most guarded secrets at this family own company, and has been passed down from one generation to another. Extracting the oil from the nut naturally does take more time and effort, which can obviously cause time and money for companies which is why most of the Argan Oil on the market (both internal and external use) is extracted synthetically. You can FEEL and SMELL the difference between the processes. You will only get the nutrients and benefits of Argan Oil from naturally produced. This process takes the nuts and sun dries them and is hand crushed to extract the oil, unlike the counter part where the nuts are soaked in toxic chemicals to get the oil secretion. Now let’s talk about the benefits of Argan Oil. Argan oil neutralizes free radicals, stimulates cellular exchanges and improves intercellular material. High in Omega fatty acids 3, 6, and 9 Argan Oil quickly and effectively moisturizes and protects the skin's barrier. Antioxidants found in Argan Oil help protect the skin from free radicals, free radicals prematurely age our skin and disrupt healthy cell turnover. Proper moisture of the skin plays a huge roll in cell regeneration. We have witnessed miraculous skin healing personally and professionally using this "liquid gold". Few years ago Diana had an unfortunate event losing her house to a fire. Her husband got second degree burn on his face. Using Argan Oil (in the Speicalty Blend) Diana was able to heal his skin in eight days. After that we had numerous clients having the same positive quick healing results after chemical peels, skin grafting surgeries and other devastating skin traumas.